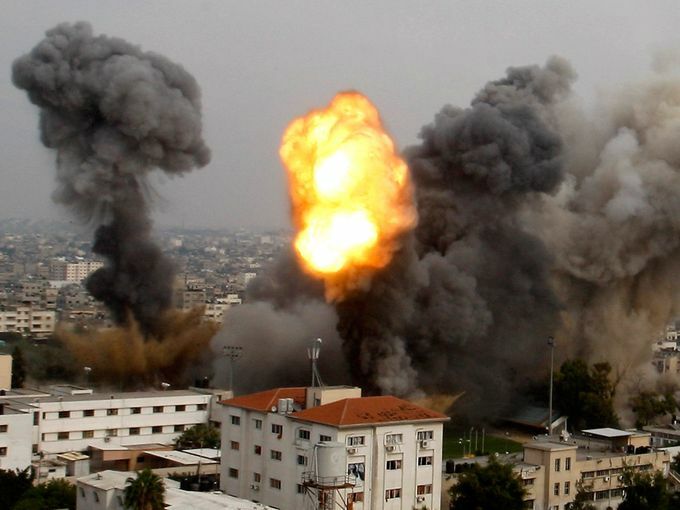 JNN 02 July 2014 Jerusalem : Israeli war jets bombed dozens of sites in the besieged Gaza strip as occupation forces shot dead a 16-year-old Palestinian in the West Bank early Tuesday. The attacks come after Israeli soldiers discovered the bodies of three missing settlers whose disappearance and killing it blames on Hamas despite revealing any evidence that links the crime to the Islamist group. Prime Minister Benjamin Netanyahu had promised Hamas would pay after the discovery of the three Jewish seminary students’ bodies under a pile of rocks near the West Bank city of Hebron on Monday. The Israeli military said aircraft attacked 34 sites in Gaza, mostly belonging to Hamas, though its statement did not link the strikes to the abductions. Hamas has denied Israel’s allegations about its role in the disappearance of the students as they hitchhiked near an illegal Jewish settlement on June 12. Palestinian medics were cited by local news agency Ma’an as saying that 16-year-old Youssef Abu Zagha died after being shot in the chest by Israeli occupation forces in the Jenin refugee camp early Tuesday. His death brings to eight the number of Palestinians killed in the West Bank by occupation forces since the army launched a major offensive ostensibly to find the missing settlers. Six of the Palestinians were shot dead, while another two died of heart attacks during raids on their homes. Israel confirmed shooting Abu Zagha, claiming he was a “Hamas operative” who threw a grenade at occupation forces. On Monday Israel set off explosive in the family homes of two Palestinian men it suspects of being behind the killing of the settlers. An army spokesperson said they blew open a doorway in one home. The other property was on fire after the blast. Neighbors said both houses were empty. Israel could now turn its attention toward the Hamas-controlled Gaza Strip. Israel has been battling a surge in rocket fire from Gaza and could step up the intensity of its reprisals. It also might consider stronger political action. Netanyahu has urged Abbas to disband a unity government he recently formed with Hamas’ backing. The Israeli leader will almost certainly step up the pressure on Abbas. Israeli media have also said that Israel might consider deporting Hamas leaders in the West Bank to Gaza. In Gaza, Hamas spokesman Sami Abu Zuhri warned Israel against any broad offensive. Gaza militants possess thousands of rockets, and would almost certainly unleash heavy barrages at Israel if Israel attacks. “Netanyahu should know that threats don’t scare Hamas, and if he wages a war on Gaza, the gates of hell will open on him,” he said. This entry was posted in Middle East and tagged Gaza, israel. Bookmark the permalink.